The advice from everywhere is to store buckets of wheat, rice, beans, powdered milk, honey . . . and more. 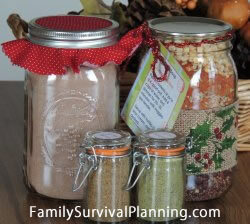 Then we are encouraged to store a variety of foods — freeze dried, canned, dehydrated, frozen. All of those suggestions are great advice and completely valid. If we open a bucket or #10 can, how long will the ingredients last once opened? How long will an opened can or bucket last? 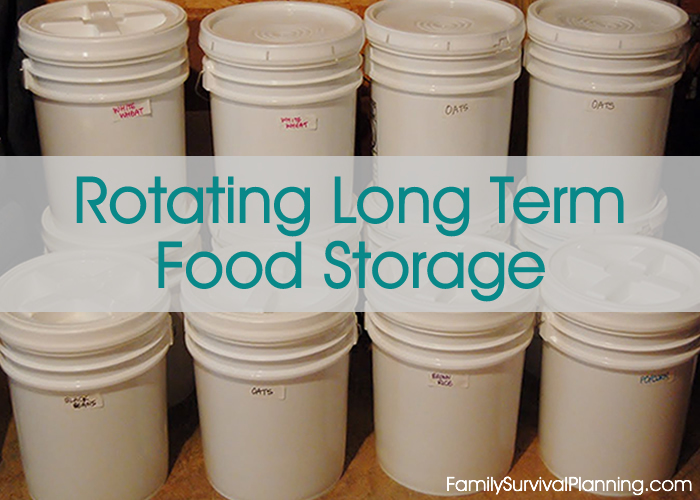 Once you have opened a can or bucket of long term food storage, you can prolong its shelf life by keeping it in the coolest, darkest, and most airtight environment possible. As a general rule, freeze dried or dehydrated foods could stay good up to one year after opening (depending on the above factors). So . . . Should I Rotate? Incorporating long term food storage items into your day-to-day menu will provide your family with the freshest, most nutrient complete foods. It also allows your family to get used to these products by making them part of your regular diet. It's just a known fact that fresher foods have better quality and more nutrition. There is no decrease in calories with increased storage time; however, protein quality in some foods does decrease very slightly. This is due to the interaction of some amino acids with carbohydrates and results in a slight discoloration or "browning" of some products that have been stored for a long time, such as powdered milk or enriched flour. This does not mean you can't use the product. Some minerals are lost from foods due to leaching or volatilization. Leaching involves the liquid in some food storage items, such as canned goods which could, over time, pass through the food and carry off some of the more soluble components. Leaching is not an issue if the juices are eaten along with the food. Volatilization happens when a food item turns into a vapor at relatively cold temperatures. At typical storage temperatures, iodine is the only mineral likely to volatilize, or vaporize, appreciably. For this reason, iodized salt should be stored as cool as possible and rotated regularly so it doesn't lose its savor. Pour the unused food product into a zip-top freezer bag and place the bagged food back into the can and replace the lid (to eliminate light). Pour the remaining food into a container with an airtight seal such as Snapware (Square) Airtight Dry-Food Canister Set (at Amazon) or, Walmart carries a round version. Seal with a FoodSaver to create an airtight environment. Put the food back into the can with the plastic lid secured. Storing in the refrigerator or freezer can extend the life of food. Several of my innovative readers have already figured out how to do this and customized their storage buckets to fit their family size and menu choices. There are three methods you can use to do this. Measure out the dry ingredients (either freeze dried or dehydrated) for your favorite recipes. Keep them all separate. Cut some Mylar bags to the appropriate size; make sure to seal three sides. Put each ingredient into its own small Mylar bag, put in an oxygen absorber and seal it up. 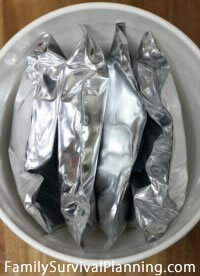 Cut some Mylar bags to any size you like; make sure to seal three sides. Fill with dry ingredients (either freeze dried or dehydrated) such as beans, vegetables, fruits, pastas, rice, etc. With this method, you may not have all the ingredients for a specific recipe, but you will only have to open a small package rather than a bigger can or bucket. For better protection from bugs, rodents or puncture, put a variety of packets into a 6-gallon bucket (or storage tub). It is not necessary to put O2 absorbers in the bucket as each package is already oxygen free. Measure out the dry ingredients (either freeze dried or dehydrated) for your favorite recipes. Put each ingredient, bigger products first (like pasta, dried meat, vegetable chunks), into the bottle. Next put all the spices in so they filter down through the bigger foods. Hold a lid over the top and shake the bottle if necessary to make everything fit. Add an oxygen absorber, put the lid on and tighten, and it will seal. Or use a FoodSaver attachment to seal the bottle. For more detailed instructions and lots of recipes, check out Stephanie Peterson's Meals in a Jar. I just purchased a copy and I'm using it because there are only two of us and this method is perfect for us. Also, they make great gifts! Need More Food Storage Menus?